There are more and more nonfiction picture books being published, a very welcome trend. Children are curious about our world and are ready to absorb, are even hungry for, information even at a very young age. It’s a natural urge for children’s book authors to oblige their fascination and to seek new angles to entertain and educate. 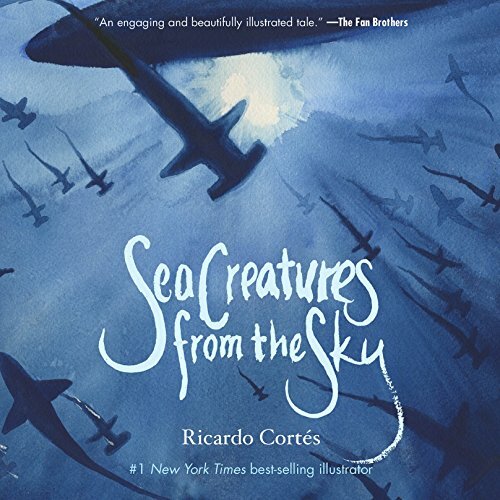 Sea Creatures from the Sky is one attempt to tell the tale of a baffled shark who’s being studied by scientists, who he experiences as “creatures from the sky” as they float above him in their boat. Telling the story from the shark’s point of view is a sure way to get readers to identify with his predicament. He tries to eat a little fish who has a hook; thus he’s hoisted onboard to meet “the two scariest creatures I’ve ever seen.” Now he’s measured and probed. But lucky for him, he’s tossed back into the ocean. And when he tells his fellow ocean dwellers, from anchovies to whales, they scoff at him. It may be weird but it’s also contrived; this tale is laid out in rhymes. Why not give the children the dignity of language without believing they will only be interested because of rhyming? This approach is a throwback to early picture books that did not recognize that children’s curiosity will extend to language. Literacy has its own lure, even to three year olds. Writers are taught only to rhyme if they are a master of poetry. It's a pretty good rule. What exactly does that mean? In this picture book, the story is also given to us in double page spread illustrations. Cortes is clearly an artist who offers us evocative pictures. In fact, this book would have worked as an entirely wordless one. The bippity-bop rhymes detract from the encounter the shark has with the scientists. Wordless books have the advantage of encouraging children to narrate stories themselves, in their own words. Sometimes that is the more creative, respectful way to approach some tales. One can applaud Cortes for inviting us to learn about sharks. And his many ocean renditions, as well as those of the skies, are lovely. His passion on the page makes it clear he’s a painter first. Going forward, one would like to see a passion for words in his books as well, and the respect for his audience who are busy experimenting with them as they explore the world on so many levels. Despite the small criticisms, children will enter and emerge from this book with a new understanding of humans' interest in sharks and ocean life.